At Headwaters, the elements necessary for a healthy lifestyle are built right in. Miles of trails, neighborhood parks and a yoga lawn make it easy to get your daily dose of fresh air, and at HW Fit you can get in your workout, rain or shine. With so many options to choose from, living a more active life has never been easier at Headwaters. 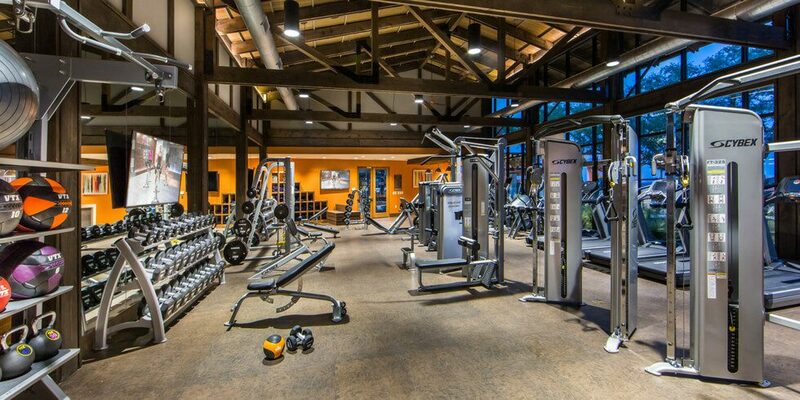 Headwaters’ spacious state-of-the-art fitness center, HW Fit, is filled with all of the equipment you need for your favorite workout routine, whether you enjoy reps or steps. And, since HW Fit is available to all residents and centrally located within the community, you won’t have to pay for an expensive gym membership or drive across town again. Just stop by and hop on one of the interactive Expresso bikes for some fun cardio, utilize the rack training system to strengthen your core or pop into the group fitness room to take advantage of the Wellbeats™ virtual fitness classes available on-demand. And all the while, you can enjoy Headwaters’ amazing Hill Country views through a wall of floor-to-ceiling windows. Whether you need some fresh air, or the Central Texas weather is just too good to pass up, there are plenty of options to move your workout outdoors. Miles of trails wind throughout the community and connect to the adjacent greenbelt, perfect for a quiet morning jog, invigorating bike ride or evening hike with the neighbors. If you enjoy a little friendly competition, the beautifully maintained playfield provides space for a spontaneous game of soccer, frisbee or touch football. And for a more relaxing experience, just steps away from HW Fit is the yoga lawn, where you can greet the morning with sun salutations. Even Headwaters’ youngest residents have options to choose from to stay fit and healthy. An adventure playground, complete with a natural playscape and tot lot, is perfect for letting the kids burn off some steam after school. Neighborhood parks featuring a croquet lawn, picnic areas and easy trail access are just the place for taking Sunday afternoons from lazy to lively. And when the weather is warm and the sun is shining, the resort-style pool and splash pad are a fun way for the whole family to get some exercise and spend time together. Headwaters is a community built to promote an active, healthy lifestyle. To learn more about Headwaters and everything it has to offer, join our Founders Club and stop by for a tour any day of the week.